The Drava River rises in the Toblach field in Italy. It flows through Austria and enters Slovenia near Dravograd. It leaves Slovenia at Središče ob Dravi. It flows almost 323 km through Croatia, with a height difference of 115m and flows into the Danube at Aljmaš. The Drava connects the Alpine and Pannonian regions. On the profile of the border between Austria and Slovenia, the catchment area is approximately 12,000 km2, and at the profile of Formin Hydropower Plant, the catchment area is 13,590 km2. There are two relatively large tributaries (Dravinja and Pesnica) between the Formin Hydropower Plant and Varaždin Hydropower Plant, so that the catchment area at the profile at the Varaždin Hydropower Plant is 15,379 km2. The Drava is the biggest tributary of the Danube in the Republic of Croatia. 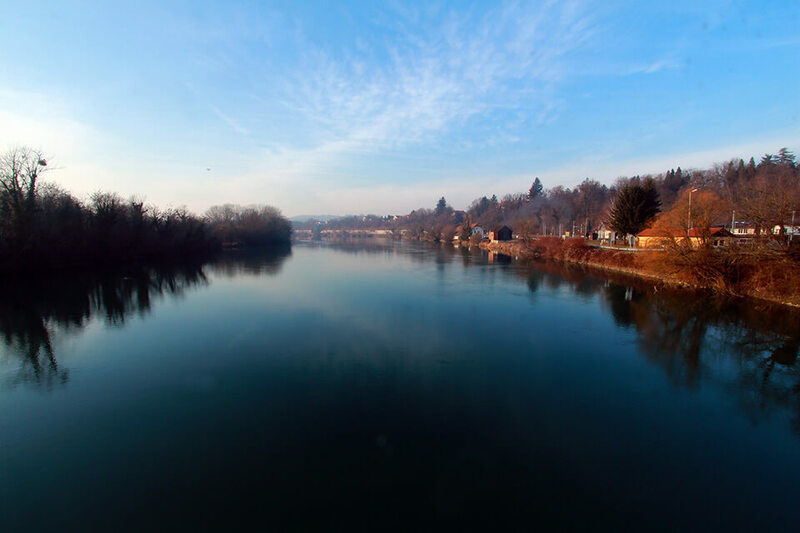 The part of the Drava that flows through Croatia is 322.8 km long (the entire length of the Drava is 749 km) and in individual parts forms the Slovenian-Croatian and Croatian-Hungarian state borders. The area of the Drava basin in Croatia is 7015 km2 (16.5% of the total area of the Drava basin, which is 41,238 km2). 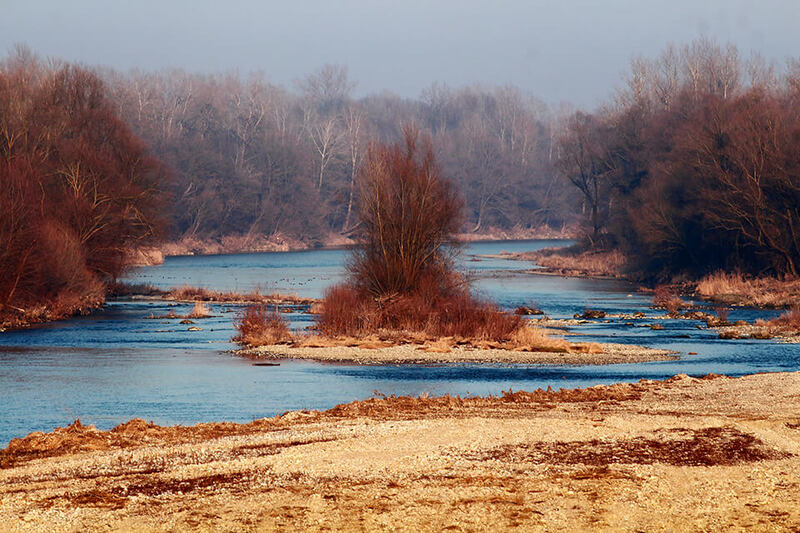 The Drava has a fluvial-glacial water regime – it is characterised by a small volume of water in winter and large volume of water in the second half of spring and at the beginning of summer. 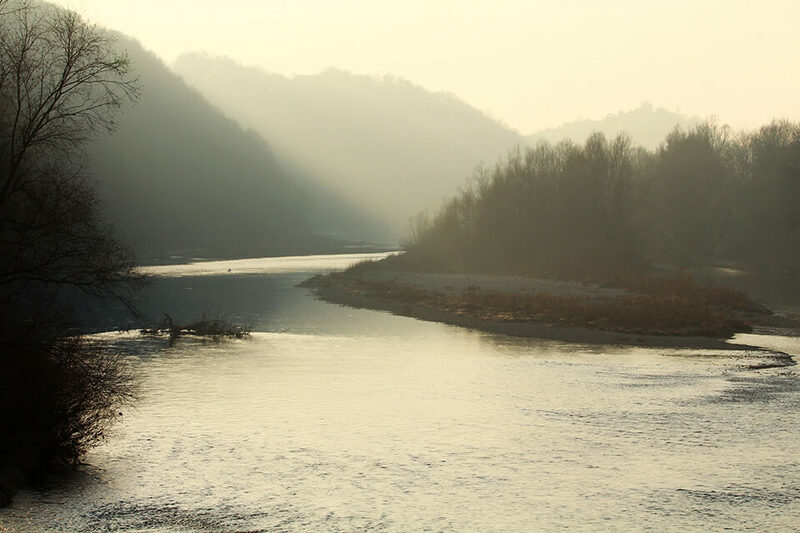 Thus, the Drava has the lowest flows in January and February, while they are highest in May, June and July due to the melting of snow and ice and the highest annual quantity of precipitation. The average flow of the Drava in Croatia ranges from 326 m3/s at the border with Slovenia to 561 m3/s at the outflow into the Danube. In Slovenia, the Drava flows through an alluvial plain (Ptujsko polje), which at the state border continues to the alluvial plain of the Varaždin field. In this section, the Drava has three right tributaries (Zajza, Škarnik and Pošelitva) and six left tributaries (Pesnica, Pušenski potok, Frankovski potok, Libanja, Črnec and Trnava Draska). In this part, there is also the Drava riverbed at the Formin Hydropower Plant (from km 314+100, where the inflow of the outlet channel of the Formin Hydropower Plant is located, up to km 322+100), the accumulation reservoir of Ormoško jezero/Varaždin Hydropower Plant (from km 308+600 to 312+600); on the stretch from 297+600 to 308+600, the Drava is located alongside the Varaždin Hydropower Plant. Constant floods over a wide area and also difficulties in navigation at low water levels prompted the construction of many structures at the beginning of the twentieth century, and thus, from 1805 to 1848, on the section of the Drava from the inflow of the Mura River into the Drava, 62 canals were dug, shortening the river flow by 75 km or 23% of its previous length. In order to facilitate navigation along the Drava, systematic regulation works on the river began in 1884, and in 1908 riverbed regulation began with the same purpose. Until the World War I, the Drava was one of the most regulated rivers in these parts, and ships sailed up to Botov. After 1918, the volume of traffic on the Drava decreased due to the new political division and the navigation route was shortened to Terezino Polje. The specificity of the water area in the current and future state and the economic criteria as the basic principle were decisive in determining the optimal technical solutions of watercourse regulation and flood protection. Since a large part the Drava forms the state border, the planning of work in sections of common interest with neighbouring countries is implemented on the basis of inter-state harmonised studies. Large regulatory interventions primarily took place after the flooding of the Drava in 1965 and 1966 upstream from the inflow of the Mura, and in 1965, 1966 and 1972 downstream of the inflow of the Mura. Due to the instability of the riverbed, many embankments were reinforced and sills, barriers and canals were built. The Drava has always offered the possibility of a transport connection, both by navigation on the river and along the coast, which is mostly in the alluvial plain. Settlements existed along the Drava (at Ptuj, Petrijanec) in Roman times, and due to the richness of forests, rafts were used on the river. The Formin and Varaždin hydropower plants were built on a stretch of the Drava which is of common interest for Slovenia and Croatia. Hydropower plants are designed and implemented so that they ensure protection from floods with the return period of 1000 years. Next to the hydropower plants, there is the (old) riverbed of the Drava, which lies downstream from the Formin Hydropower Plant, located on the right side of the hydropower plant canal, and downstream of the Varaždin Hydropower Plant barrier, on the left side of the hydropower plant. Thus, a larger volume of medium and low flows flow along the inflow channel to the Formin Hydropower Plant, while in the riverbed only the prescribed minimum/ecologically acceptable flow remains, which is 10 m3/s in the summer (from 15th March to 15th October), and 5 m3/s in the winter (15th October to 15th March). The situation during high waters is completely different, since, due to the operating regime of the power plant, most of the water flows along the riverbed and only a smaller amount through the channel. The consequences of the changed outflow conditions are noticeable in the morphology of the riverbed and the decay of some water facilities, which are mostly combined with wood and fascines, which are dry for the most of the year. The consolidation of dunes and their intense overgrowth occur, which makes moving the sediment (gravel) impossible. Bare gravel deposits are increasingly rare, and are disappearing; they are being replaced by heavily overgrown riverbanks and islands. The result is a significant reduction in the flow profile and an associated increase in the level of high waters and increasing magnitude of flooding, with lateral and depth erosion and damage to opposite banks on stretches where the dunes have grown excessively enlarged. Although the flow of sediment is interrupted by the chain of hydropower plants on the Drava, the considerable enlargement of dunes and increased sediment deposition can be seen after each high water period. While larger fractions are deposited in the middle of the riverbed, floating sediments, which are still transported along the riverbed, are deposited along the banks and especially on overgrown parts, where the speed of the water flow decreases. The sediment probably originates primarily from lateral and local depth erosion, which is a consequence of the reduction of the profile due to overgrowth and the increase in dunes, both on the banks and in the middle of the riverbed. On the basis of observation or monitoring of the situation in recent years, it has been established that the riverbed of the Drava is completely full at a flow rate of about 500 m3/s, and that spills in groves, meadows and auxiliary facilities in the coastal belt occur. At larger flows, the extent of spills rapidly increases. At a rate of 800 m3/s, the flooding of the Ptuj – Zavrč border crossing road starts at Borl. The road is closed until the water level drops. At higher flow rates (Q10 and more), individual residential buildings in settlements Nova vas pri Markovcih, Vapošnica, Muretinci, Gajevci, Stojnci and Dolane, chickens farms and other infrastructure are flooded. Lateral erosion also presents a potential danger. In sections of the Drava with water steps (Varaždin, Čakovec and Dubrava hydropower plants, from km 241+850 to 312+600), the natural outflow conditions have changed. The system of hydropower facilities (accumulation dams, inlet and outlet channels, barriers and other facilities), which was built for the purpose of flood protection, ensures a high degree of safety with proper management and technical maintenance, given that the hydropower facilities are dimensioned for flows with a millennium return period (Q = 3,300 m3/s). In addition, on the one hand, with the construction of the aforementioned hydropower facilities, the level of security of water management embankments was increased due to the reduction of flood waters that flow along the “old riverbeds”, while on the other hand the safety level was reduced due to the growth of vegetation in the old riverbed. Due to transverse objects in the section of the watercourse under consideration, there are changes in the transport of sediment and therefore changes in the hydromorphological state. In the upstream part of the Drava stretch of common interest, the right bank is high and there is no need to build protective structures. When the alluvial plain (Varaždin field) opens, the right bank is no longer high. 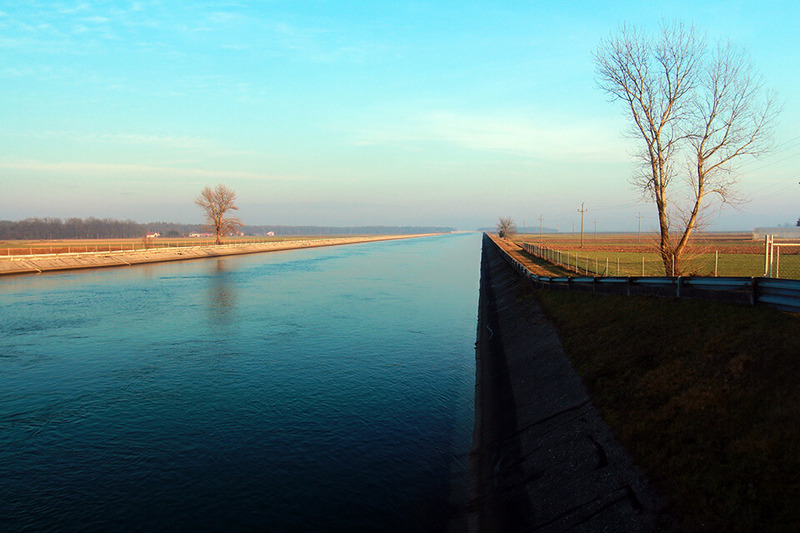 On the right bank of the Drava lies the Virje Otok-Brezje flood protection embankment, which is connected upstream to the high bank and downstream to the dam of the accumulation reservoir of the Varaždin Hydropower Plant. This embankment is 3.72 km long, and does not provide adequate protection against high waters, because it is too small and does not have a sufficient profile. In the flood event of 2012, the water overflowed and broke through this dam. Downstream of the Varaždin Hydropower Plant barrier, the settlement of Svibovec is located between the hydropower plant channel and the Drava. To protect this area, the Varaždin-Svibovec-Družbinec flood protection embankment was built; this is linked to the facilities of the Varaždin Hydropower Plant. Downstream from the Markovci Barrier (the Formin Hydropower Plant barrier), the left bank is low and often flooded. After the inflow of the Formin Hydropower Plant outlet channel and Pesnica, the left bank is high. In addition, a railway line is located close to the bank, which increases protection against high waters. In the floods of 2012, the high waters of the Drava flooded and overflowed the outlet channel of the Formin Hydropower Plant in two places and caused great damage. Downstream from the Varaždin Hydropower Plant barrier, there is a narrow retention area on the left bank, on the edge of which is a series of settlements. Between the Drava and the settlements, the railway line is located, which is raised above the surrounding terrain and provides protection against high waters in the form of an embankment. Farther downstream, the role of the embankment is taken over by the Čakovec-Ormož road, from which the Trnovec embankment continues. Photographs of the river basin in PHOTO GALLERY.